The moving average is by far the most common of all technical indicators that you will see used on charts by professional and retail traders alike. A Moving average strategy is easy to use and add to a chart, but they can also give you some of the simplest trading signals to act upon. However, although the moving average may give out some easy and stress free buy and sell signals; with a little bit of further basic chart reading, your moving average system or strategy if you prefer can become a finely tuned trading master piece. In this tutorial we are going to be looking at how you can trade the DAX using a triple moving average and some simple chart reading. The results and obviously profits over time can be greatly enhanced by putting in a little bit of extra effort. If you are serious about learning to trade the markets then my advice to you is to learn to trade one particular strategy that suits your strengths and learn it well. The moving average strategy that we are going to cover here today can be adapted to suit your own style, goals and markets. We are going to be trading on the DAX with a triple Exponential [EMA] moving average 20,50,100. We will not use any other indicators. So we will be looking to trade the triple moving average crossovers but also the 20/50 crossovers if they are above or below the 100 and are in sync with the main trend direction. To give us a greater edge of a successful trade, we are also going to be looking at using some simple price action within the strategy and also the use of support and resistance lines too. The overall idea is that combining some of the most useful but simple chart indicators along with basic price action chart reading, the complete trading rookie will be able to trade profitably with a little practice. Moving averages smooth out the prices that you see on a chart. This smoothing of the price data can help give you a clearer picture of what and where the price on a chart is heading. Combined with the ability of producing crossover signals when using multiple moving averages, you can understand the reason why the moving average is so commonly used. You have to remember though, that the moving average is a lagging indicator. This means that the data that the moving average offers you is delayed. However, when you use a moving average along with some price action and S&R levels, you get a pretty reliable trading strategy. We are also going to be using so simple price action techniques that will help us identify better entry points to open our trades. Price action is one of the most effective ways to trade the markets. The beauty of using price action along with moving averages is that the moving averages are alerting you or have already alerted you to a possible trade. You will now find it easier to identify the price action at key areas by identifying common and reliable candle patterns. Price action trading when used to confirm moving average signals makes for an awesome trading strategy that can be used on most charts. Many traders fail to make a system or trading strategy pay because they are too preoccupied with trying to learn too many trading strategies at once. They move from one system to the next and even try trading multiple systems at once… without ever mastering any of them! Using our trading system detailed here, can be a great place to start learning a solid trading strategy that can then be tailored further to your own personal trading style, strengths and weaknesses. Maybe you’ll prefer 4 hour charts? Maybe you’ll add a couple of different indicators? Whatever materialises on your journey as a trader is great, but learn the foundations first… and learn them well. 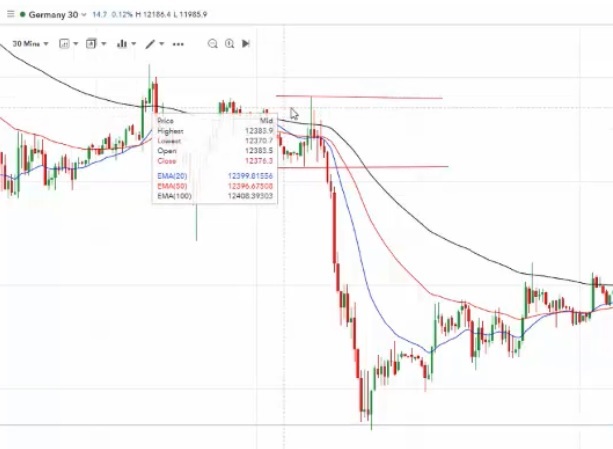 Here is the video that will show you how to start trading the DAX with 30 Minute candles, price action and an easy moving average strategy. Take some notes as you go along as this will help when you start to paper trade rather than keep watching the video. Please give us a thumbs up on Youtube if you like it. Chris is doing the video as always but you can email me if you need any help. As already said earlier on, there is nothing complicated about this strategy at all. Scalping Trading – Fast Profits?